you want sprinkles with that govcamp? UKGovcamp supremo, Mr Steph Gray has hung up his govcamp clipboard* and hoodie. Sad, but understandable. It’s quite a lot of work, you know, un- organising unconferences?! The news has prompted a bit of discussion about how UKGovcamp can be improved for 2014. If, indeed, it can be improved. Lloyd Davis (master of ceremonies at UKGovcamp in recent years) has a brilliant post on his blog. And regular govcamper, Stefan Czerniawski, has also written a great post. The discussion continues on the Google Group set up by James Cattell. I’ve been watching with interest – not least to see if we can pinch any of the good ideas they come up with ;). One of the great things about unconferences is that you can tinker with the format right up to the last minute. Another great thing about unconferences is that no-one ‘owns’ them, so everyone can help improve them! Scotgovcamp 2013 is still very ‘tinkerable’. Personally – and I want to emphasise that this is very much a personal view – I like plain old vanilla govcamp. You turn up with stuff you want to discuss, if other people want to dicuss that stuff too, then you discuss that stuff. The discussions are enough for me. As far as I’m concerned, we don’t get enough opportunities in the public sector to talk about the stuff** that we want to talk about, rather than someone else’s agenda. If something more tangible follows on from those discussions (a project, development of an app, a new network, whatever), then great. But I don’t think we need to be setting objectives or defining desired outcomes. Having said that, there may be scope for building in opportunities to do a bit more than just talk. 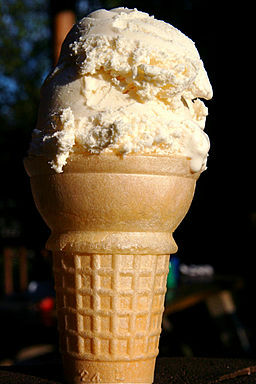 I’m not adverse to some sprinkles on my cone, or even a flake. Leah, I know, is really keen to ensure that we’re not ‘all talk and no consequence’ and that we facilitate ongoing activity where we can. If you have views on this – whether you are coming to Scotgovcamp or not – please do share them here. Or add them to the planning wiki on the Scottish Public Sector Digital Group Knowledge Hub. Just made some more tickets available for Scotgovcamp 2013: http://scotgovcamp13.eventbrite.co.uk/.